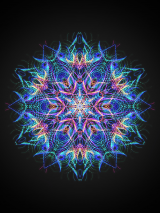 Inspirit is a lightweight and simple painting software that offers you the possibility to easily create great-looking kaleidoscope artworks and mandalas and view them slowly evolve as time passes. The program beautifully blends spirituous, art and relaxing elements. This small tool will help you unwind in an artistic manner. Inspirit is an application created for old and creative souls. Just mediate, paint and feel the moment of presence with this tool. Nice animated kaleidoscope artworks and swirling patterns can be effortlessly created with this program. Inspirit lets you choose from several brush types. Moreover, you can create your own brushes. Several glow effects can be applied, as well. The utility lets you work with several color variations and eye-pleasing gradients. The created images can be shared with your friends and family on social networks, or you can save them to your image library. Multiple brush types can be used. Inspirit has been tested by Download82.com team against viruses, spyware, adware, trojan, backdoors and was found to be 100% clean. Our editors will recheck this software periodically to assure that it remains clean.